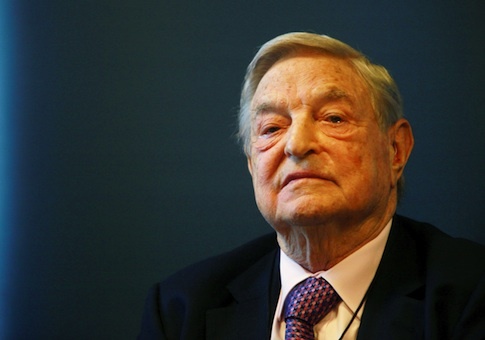 According to Forbes, George Soros is worth $24 billion, has "set the standard for hedge fund success" and "no longer manages his own money" having turned that duty over to his son Robert and Chief Investment officer Scott Bessent. Today he "focuses most of his time on philanthropy and politics." Aren't we just so fortunate. - W.E. Soros told his biographer Michael Kaufman that his “goal” was nothing less ambitious than “to become the conscience of the world” by using his charitable foundations,8 which will be discussed at length in this pamphlet, to bankroll organizations and causes that he deems worthwhile." The upper portion of this page is devoted to organizations that are funded directly by George Soros and his Open Society Institute (OSI). The lower portion of the page focuses on organizations which do not receive direct funding from Soros and OSI, but which receive money from one or more groups that do get direct OSI funding. America's Voice: This open-borders group seeks to promote “comprehensive” immigration reform that includes a robust agenda in favor of amnesty for illegal aliens. American Institute for Social Justice: AISJ's goal is to produce skilled community organizers who can “transform poor communities” by agitating for increased government spending on city services, drug interdiction, crime prevention, housing, public-sector jobs, access to healthcare, and public schools. Applied Research Center: Viewing the United States as a nation where “structural racism” is deeply “embedded in the fabric of society,” ARC seeks to "build a fair and equal society" by demanding “concrete change from our most powerful institutions." Constitution Project: This organization seeks to challenge the legality of military commissions; end the detainment of "enemy combatants”; condemn government surveillance of terrorists; and limit the President's executive privileges. Human Rights Campaign: The largest "lesbian-gay-bisexual-transgender" lobbying group in the United States, HRC supports political candidates and legislation that will advance the LGBT agenda. Historically, HRC has most vigorously championed HIV/AIDS-related legislation, “hate crime” laws, the abrogation of the military’s “Don’t Ask, Don’t Tell” policy, and the legalization of gay marriage. Rebuild and Renew America Now (a.k.a. Unity '09): Spearheaded by MoveOn.org and overseen by longtime activist Heather Booth, this coalition was formed to facilitate the passage of President Obama’s "historic" $3.5 trillion budget for fiscal year 2010. In addition to those organizations that are funded directly by George Soros and his Open Society Institute (OSI), there are also numerous "secondary" or "indirect" affiliates of the Soros network. These include organizations which do not receive direct funding from Soros and OSI, but which are funded by one or more organizations that do. Vote for Change: Coordinated by the political action committee of the Soros-funded MoveOn.org, Vote for Change was a group of 41 musicians and bands that performed concerts in several key election "battleground"states during October 2004, to raise money in support of Democrat John Kerry's presidential bid.